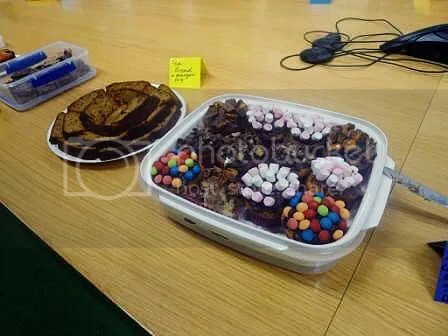 Baking is fun at the best of times, but when it’s for charity it is so much more fulfilling. 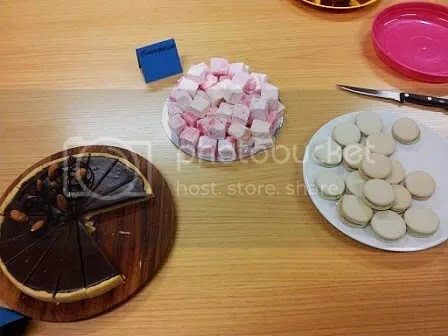 My boyfriend works for IBM, and currently he is on a project in an ANZ office. 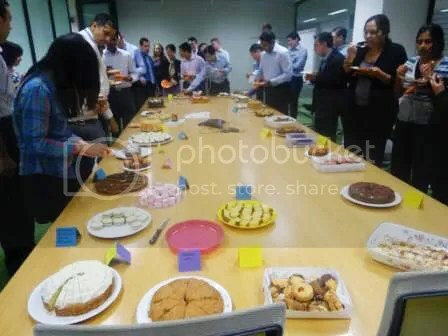 One of the ANZ offices he is located at decided to host a Big Cake Bake fundraiser for the Red Cross. I was more than happy to oblige when asked to do a cake, and more than happy for the excuse to make a cake I’d been wanting to do for a while. 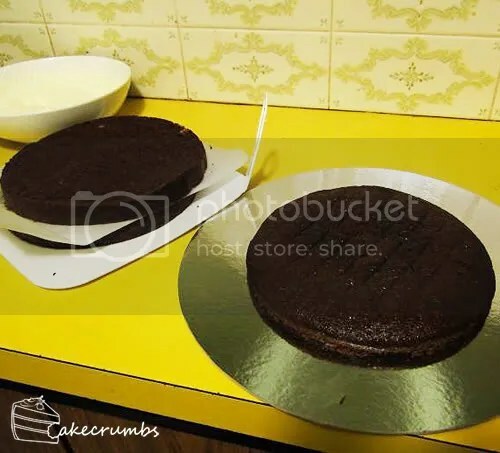 The cake itself is a dark chocolate, largely owing to the brown sugar in the recipe. 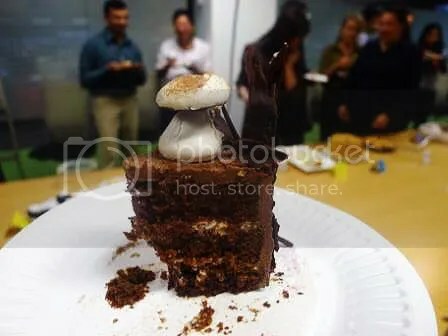 This is one of those celebratory, rare occasions where the cake came out perfectly flat on top. No need to cut off any domes here. 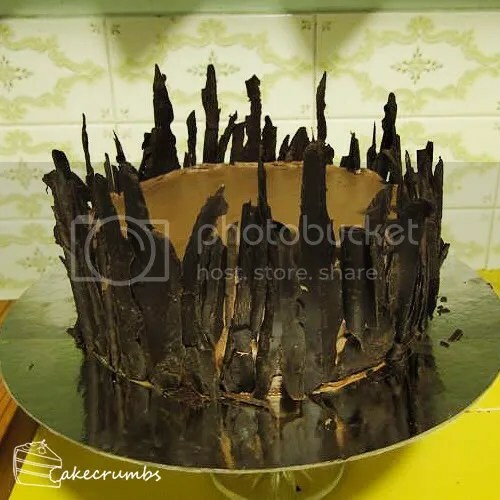 I actually took care this time to ensure I eliminated all the reasons for getting a domed cake – I’m usually much too lazy. 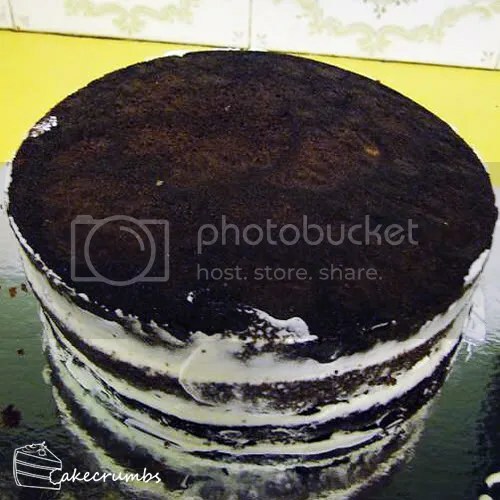 I layered the cake with unsweetened whipped cream and assembled. 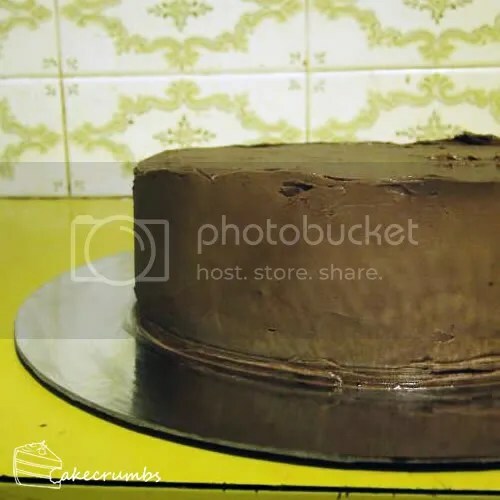 Finally, I covered the cake with a dark chocolate buttercream. It went on so smoothly it was almost a shame to have to over it up. I think that owed largely to how stinking hot it was that night. Well, stinking hot for Melbournites who haven’t yet gotten used to 40C weather being the norm again. Nonetheless, the 30C weather kept it rather melty. I totally could have eaten a bowl of this stuff, and I don’t even like dark chocolate. 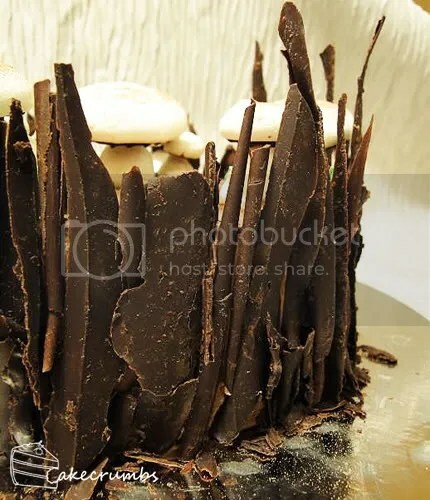 The plan was to cover the outside with chocolate caraque curls. However, again the hot weather wreaked havok and I couldn’t get my chocolate to set enough for this to work. What I ended up with was more bark-like segments of chocolate. 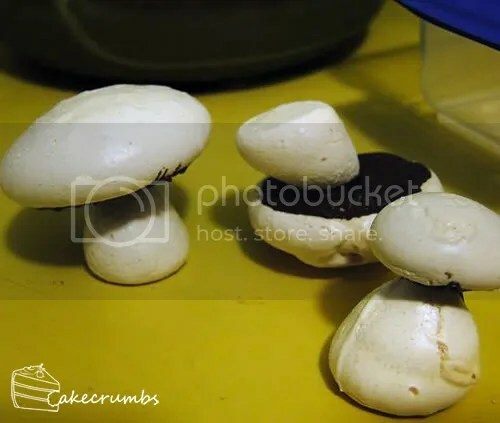 I made some mushrooms from swiss meringue and covered the bottoms in dark chocolate, which I streaked to make look more realistic. 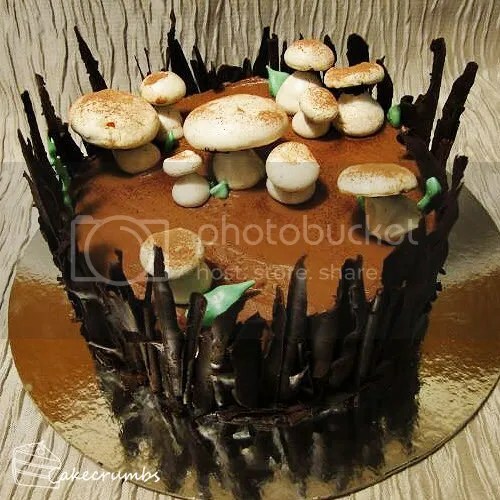 Then I put it all on the cake, dusted with cocoa, and voila! It was lots of fun to make, more so knowing it was for a great cause. 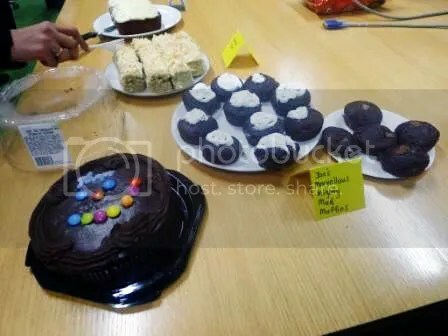 One of the lovely ladies at my boyfriend’s work, Shazrina, was kind enough to take some photos I could share with you all. 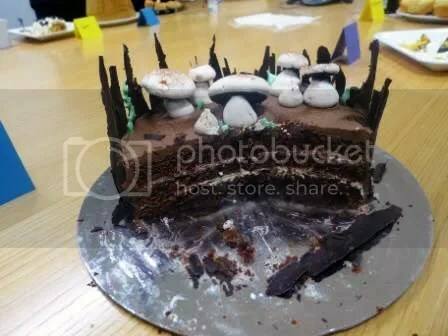 Here’s the inside of the cake (we all know how much us foodies love to see the dissected version of the baked goods). 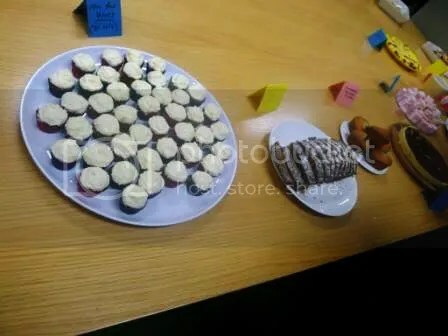 And here’s a few photos of the delicious-looking treats people brought in for the occasion. 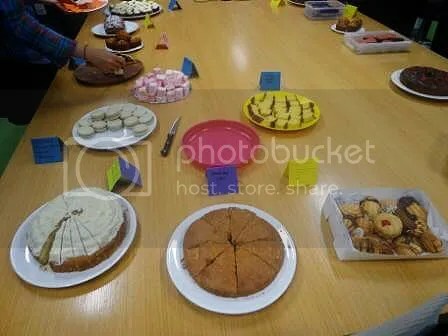 The Big Cake Bake raised $435 from the participants, which ANZ matched, so in total the fundraiser achieved an $870 donation for the Red Cross. Stellar effort from all involved! 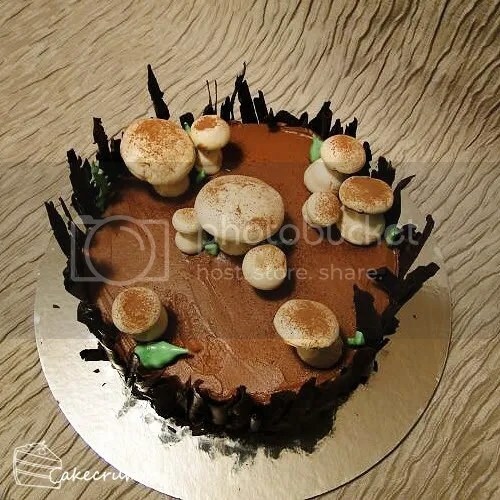 The meringue especially is so simple, but looks really real for minimal effort – my favourite kind of decorating! 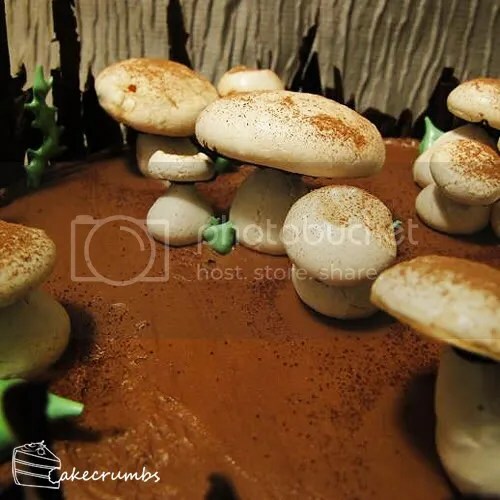 Long, droolworthy post full of delicious pictures, but no recipe? Not right now, unfortunately. I haven’t been home all week so I don’t have my cookbooks handy, and I have a backlog of things to post so wanted to get one out of the way while I had a moment. Will be revisiting that recipe very soon, but even if not I will post the recipe in a new post in the very near future. 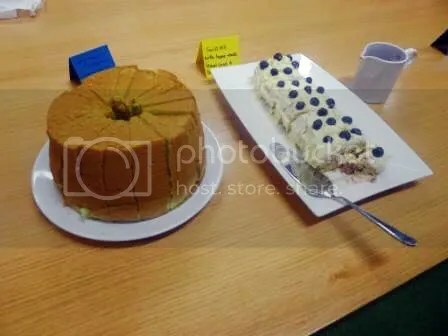 It’s really only the cake I used the recipe for, rest was done by feel. Buttercream was done with leftover dark choc, leftover butter (maybe 150g of each) and then I beat in enough icing sugar until the consistency/taste was right. Swiss meringue was made with 1 egg white : 1/4 cup caster sugar, and I baked it at 100C until they were cooked through (maybe 1.5 hours). oh my goodness that is SO gorgeous.